The tin on the right is the version I remember. But holy cow, the older one is pretty rad too. I hope you’ll indulge me, in this first in a series of blog posts about the sights, sounds and tastes that inspired Starbunny, Inc.
Long before I was lactose intolerant, I drank a lot of strawberry milk as a kid. My family would get the large tins of pink powder and mix it into milk. Ideally in clear glasses, so you could see the various shades of white and pink blend together. My favorite part was the gloopy concentration of sugar that would collect at the bottom of the glass. I’d stick my tongue in at the end, feverishly lapping up every last grainy drop of artificial sweetness. But I’m jumping ahead of myself. While drinking my glass of strawberry milk, I’d always take time to appreciate the packaging. This is something I did a lot as a kid, especially with cereal, toys and video games. On more than a few occasions I’d end up enjoying the box art on an action figure even more than the toy itself! Those charming tin cans with rounded edges that Nestle Quik powered mix used to be sold in were nothing short of magical. They reminded me of personal banks, and sometimes the lid would be stuck on so tight I’d need a penny to pry it open. And of course, the main attraction of packaging was admiring the illustrations. In the 80s (and obviously earlier) the Quik mascot was a pink bunny wearing blue overalls, with a strawberry on his head! In one incarnation the strawberry was a photograph, pasted onto the cartoon art of the bunny, who was drinking out of a photo of a real straw placed in a real glass. I didn’t know what mixed media was yet (and clearly this would preface my future enjoyment of Who Framed Roger Rabbit) but I was transfixed by this fun combination. I never drank the chocolate variety of Quik, but a bit of internet research shows that the brown bunny that appeared on alternate packaging never wore anything on his head, simply sporting a corporate letter N around his neck. 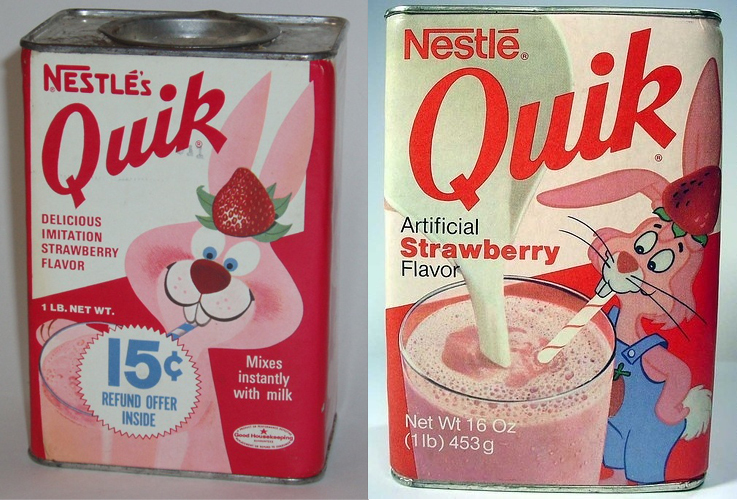 At some point Nestle Quik became rebranded/abbreviated to Nesquick, and the brown bunny was promoted to mascot for both Chocolate and Strawberry (as well as Vanilla), and his pink colleague was let go. I guess it cost too much to have more than one bunny on payroll? As a kid with an aversion to chocolate (I’ll go into that in another blog post), this upset me greatly, but I should probably get back on topic. So, yeah: countless hours drinking flavored milk, admiring the container, and thinking about this bunny with a strawberry on his head. Where did he come from? What did he do for a living? Was he a strawberry farmer? Did he have a factory where he processed strawberries into pink powder? Did he get rich selling the recipe? 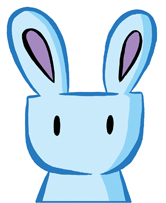 I also hazily remember an image of the Quik bunny hanging out near a river of milk… I can’t remember if I actually saw this image printed on the back of a tin, or if it just appeared in one of my daydreams. At any rate, many years later, I started developing a story for the Flight anthology called “The Great Bunny Migration” (which you can read in the archive section) that built off some of these daydreams I had about bunnies in the milk business. The ideas continued to expand in my brain, with bunnies making cameos in Astronaut Academy, and now Starbunny, Inc. But strawberry milk is just one ingredient added to the inspiration blender. I’ll share more, in the coming weeks!